Source: Why do we do what we do? Many a parent has known the challenge of answering the incessant questions of “why?” asked by their young children as their little ones attempt to learn about the world around them. Some questions are easily answered while others have no easy answer. For Doug Loss, his “why” questions about faith and religion largely went unanswered by the Evangelical and Methodist churches he was a member of for most of his life. Doug did not pay much heed to the tenets of his early religious experiences; they were just there. His curiosity grew as he did, however, and he began to ask the questions that had no easy answers. Questions such as why the churches did what they did, believed what they believed, what did they represent and why, should have uniformly been answered by those whom he asked. But they weren’t. The answers Doug received were as varied as the people he asked. None of their answers were satisfactory. When the Evangelical and Methodist churches merged into one church, Doug attempted to find the answers to his questions in the adult Sunday school class that he participated in. To his chagrin, he discovered that no one else seemed to be as concerned about the “whys” of their faith as he was. Disheartened, he slowly drifted away as the entertainment factor of the church held no sway for him. In 1989, he began to date a Greek woman who took him to Holy Cross Orthodox Church and introduced him to the ancient faith. His curiosity peaked once more and the “why” questions surfaced about Orthodoxy in similar fashion to his former religion. Only this time, he received answers. The answers were serious and understandable and Doug was pleasantly surprised to hear that there were reasons for everything from why hymns were sung to why the Bible was read in the way that it was read to the history and theology behind all of it. 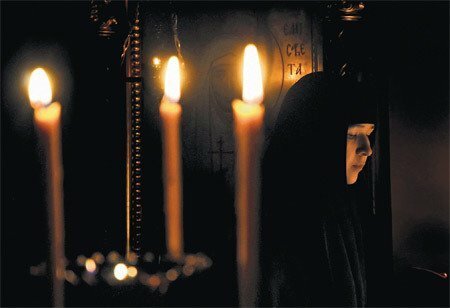 Everything in Orthodoxy is directed toward one purpose: the worship of God the Father, the Son and the Holy Spirit. Nothing folksy or jazzy in the Orthodox Church! Worship is not about entertainment; it’s about worship, plain and simple and this was the answer that Doug wanted to hear. Although he would not convert for a number of years, he continued to ask the hard questions that had no easy answer. Under the guidance of his spiritual father, Father Dan, who patiently answered his questions, Doug eventually was ready to accept and embrace the Orthodox faith. Unlike his former church, which like the impatient parent who has grown tired of the “whys” of the curious child, in the Orthodox Church, Doug found the answers he was looking for. For Orthodox Christians, there can never be too many “whys?” These are questions the faithful are more than happy to answer.